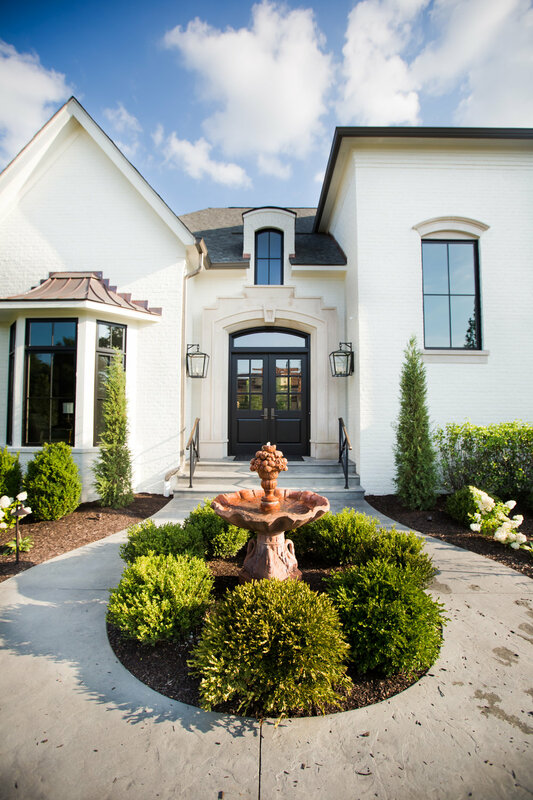 Driving through the neighborhood’s winding roads, rolling hills, and beautiful scenery, the journey to get to this new Zionsville home is only just the start of the list that will leave you jaw-dropped. It sprawls across a healthy green corner lot, and the painted white brick exterior is a stark contrast to the surrounding woods. Before you even make it to the front door, a sense of tranquility sets in as you hear the peaceful water fountain that you pass by on your way up the sidewalk. The list of features including the outdoor living space, the interior finishes, the windows and doors, and the cabinetry all combine to make this home truly one of a kind. The homeowners selected the lot because of the relative seclusion with woods bordering two of the sides. Privacy was of upmost importance for these homeowners, who had spent the last chapter of their lives living on rural farmland. “Moving from 100 acres to a neighborhood, we were interested in downsizing but were concerned that we would lack privacy. This lot seemed to answer that need,” explained the homeowner. If I were to tell you that these homeowners who were once concerned with privacy had two great room windows standing at 6ft wide by 9ft tall each, you probably wouldn't believe me. In this very same room, the adjacent wall has 16ft wide sliding doors. However, because of smart design and planning with the positioning of the home, the outdoor living space and woods provide all of the privacy that this once skeptical couple needed. “Whenever anyone steps into our home, the first thing that they comment on are our windows.” In a home featuring all kinds of unique details, the windows are just something you cannot take your eyes off of. The goal with the overall design aesthetic was to mix a feeling of old and new. The painted white brick exterior paired with the sleek and modern black windows was the winning combination to set that tone. Deb Maley, owner of A New Arrangement that specializes in interiors, had previously worked on a project that utilized Marvin Windows, and felt that their product offering was a great fit for these homeowners that wanted to bring the outdoors in. 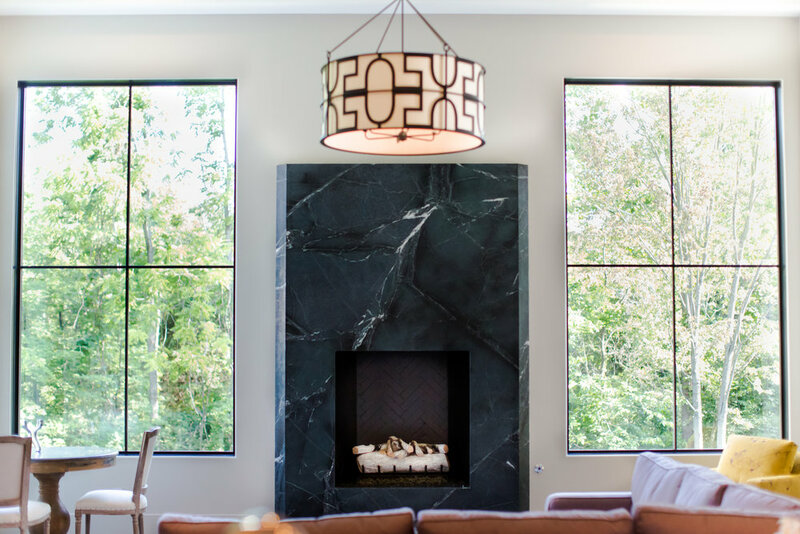 “Designing the window layout with large singular sections of glass as opposed to pairing smaller windows together to create a large view really allowed my clients to feel like the outdoors was a part of their interior living space. We chose to use simulated divided lite bars to add an architectural element that did help define the two spaces.” The result is essentially a canvas that beautifully frames the outdoor view as if it was artwork. 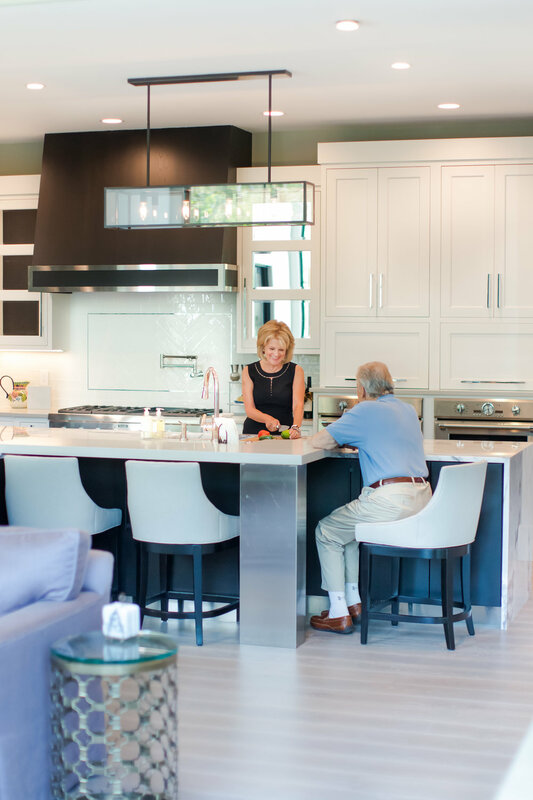 Refined taste and impeccable details are a result of a collaborative effort amongst these homeowners and their team of professionals. For additional information, please visit the respective websites below to experience their breadth of work. Please enjoy the remainder of the photo tour below.